Posted by grhomeboy in Hellenic Light Americas. No stranger to the high art of living, Maria Callas was the owner of glorious pieces of jewelry with which she adorned herself during her tumultuous life. Sparkle, however, was also a faithful companion on stage. “Maria Callas and Swarovski: Jewels on Stage at The Metropolitan Opera” a new exhibition that opened in New York last week, showcases a collection of stage pieces that will be unveiled to the American public for the very first time. The show features more than 40 items displayed alongside archival photographic material and Callas memorabilia. Before traveling on to a number of global spots, the exhibition in the Metropolitan Opera House’s Founders Hall will run to March 3. Born Maria Anna Sofia Cecilia Kalogeropoulos to an immigrant Greek family in New York in 1923, Callas made her debut in 1941. In August 1947, the rising, yet still largely unknown, vocalist appeared at the Verona Arena to interpret «La Gioconda.» For this make-or-break performance, she wore a small coronet of crystal and faux pearls created for her by the Milan-based atelier Marangoni with Swarovski stones. The evening proved to be a great success and Callas, a highly superstitious artist, insisted on wearing Marangoni pieces set with Swarovski stones from that moment on. From 1947 to 1965, the father and son duo Ennio and Antonio Marangoni worked closely with the diva to created jewelry for more than 600 stage performances. Established in 1940, the Marangoni studio has long collaborated with Austrian Swarovski to develop pieces for celebrated artists, such as Renata Tebaldi, Rudolf Nureyev and Luciano Pavarotti. Nowadays, the studio produces intricate pieces of costume jewelry for the likes of Sir Elton John, Madonna and Nicole Kidman. In 1999, the Atelier Marangoni became part of the Swarovski Group of Companies. In New York, at the MET, the exhibition highlights a number of landmark performances by Callas in works such as «Norma,» «La Sonnambula,» «La Traviata,» «Tosca» and «Anna Bolena.» Furthermore, the show celebrates the artist’s relationship with the legendary opera house: Over a 24-year period, the soprano appeared at the theater in 21 performances. For her MET debut in 1956, in which Callas interpreted «Norma,» a signature role in her extraordinary career, the diva was clad in a parure, a set of matching pieces featuring earrings, necklace and tiara. All set with Swarovski crystals, the pieces were so bright that for a televised scene broadcast on «The Ed Sullivan Show» the artist could only wear the earrings. 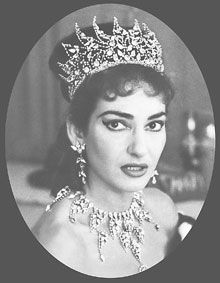 For her first appearance as «Tosca» in that same year, her stage jewelry was designed by MET stage director Dino Yiannopoulos, executed exclusively for Callas by Swarovski. At the MET, a number of spectacular pieces throw light on a dramatic life on stage. These include a choker collar set with blood-red crystal stones, a Renaissance-style cabochon-set corsage ornament as well as a Russian crown set with luxurious multicolored Swarovski gems. The diva was deeply attached to the pieces she wore. Having acquired the power of amulets, the items often traveled with her in car trunks, faithful friends during long or shorter journeys. Meanwhile, on the precious jewelry front, her husband, mentor and manager, Giovanni Battista Meneghini, had a habit of giving her a fine jewel to mark the addition of each new role in her repertoire. A stylish Callas would then mix and match real and faux, until the day director Luchino Visconti persuaded her that historical accuracy and authenticity on stage didn’t go hand in hand with fashion games, even if they came straight from the heart.